Tomoe and I took a little break to get into shape this afternoon. 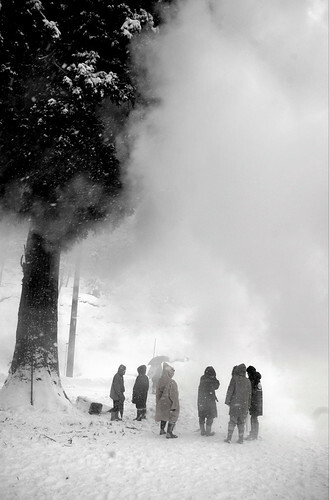 We left at 1pm, hiked up a mountain, back down to a waiting hot-spring bath, and back home in time for dinner. 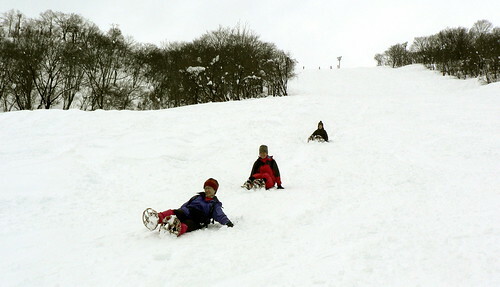 If we lived in Tokyo this would have been a full-day activity, requiring an expensive train ride to Okutama. In the photo above, you can see our house in the background... well, not really, but you can see the general area of where our house is, and can get an feeling for the size of our neighborhood, and the surrounding landscape. We got home from Tomoe's parents house in Nagoya two days ago. We were supposed to come home today, but we left early because of the fuyugata winter weather patterns closing in, meaning a likelihood of heavy snow here in Sakae. Unfortunately, we only got about 50cm. 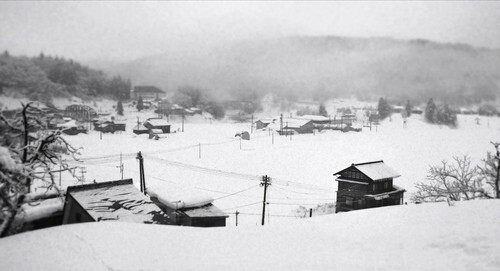 The snow stopped a few hours ago, leaving the old workaholics of the village with an itch that can't be scratched. Every day they are out there shoveling 10cm of snow of their drive as if it was a matter of life or death, while we skip shoveling in favor of taking a sled out to a nearby hill for some fun. I am sure we already have the reputation as the laziest people in the neighborhood. 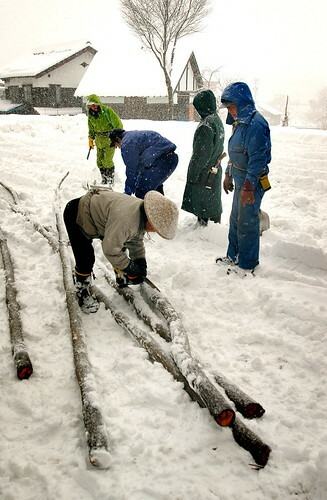 In the old days, I'm certain that daily shoveling was a necessity - without gas-guzzling snow-plows, people had to take turns clearing a path in the street. 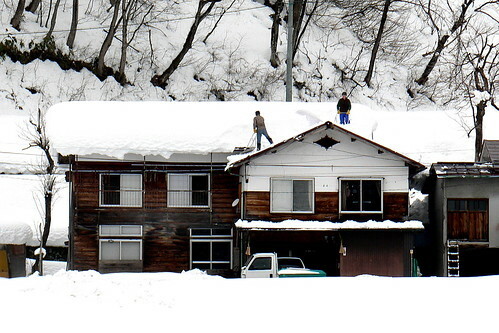 Without daily shoveling things would come to a standstill. Everyone had to help out. Everyone had a role. 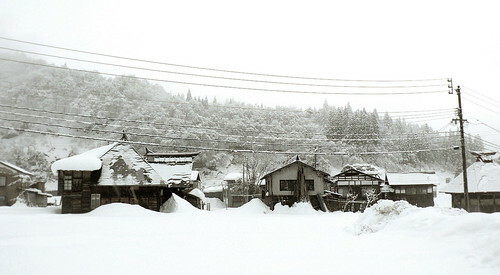 Now, with the snow-plow, thirty villagers' worth of work can be done with two people in an hour. The villagers are suddenly left with nothing to fill their time. Even the lightest snow is an excuse to get out there and shovel areas that will never be used. While I am glad that the people still have something to keep them busy, its sad that they are being kept busy with work that need not be done. 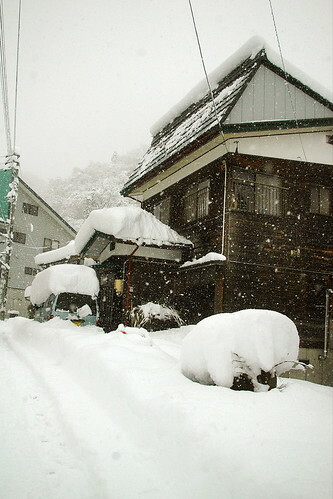 I myself wish that I could get out there and flex my long-neglected muscles, shoveling snow that needs to be shoveled. As it is, however, most of the snow around my house bothers noone, and I have to choose between doing work simply for the sake of doing work, or doing something else that may (or may not) be more productive. 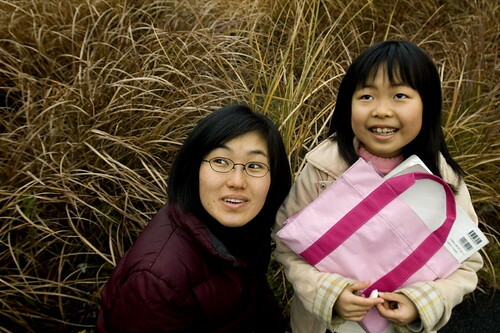 The photos are of Tomoe and her niece in Nagoya. I am ashamed at how out of shape I am now. 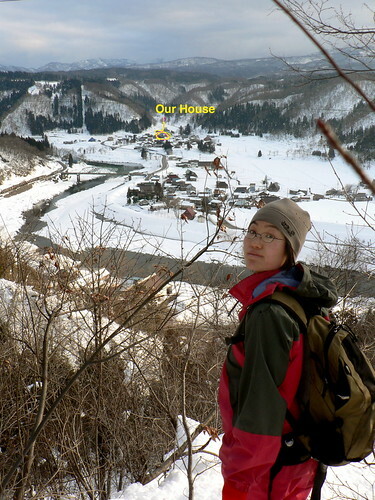 I fell out of the exercise habit while I was living in Hakuba because I was working so much more, and that work had *some* degree of physical activity. since moving here though, I have only run three times, and rarely do anything that gets my heart-rate up. What's more, a bike accident in October left me with a shoulder that, for a long time, could barely lift anything, let alone do push-ups. The shoulder is better now, but the will somehow slipped away. I also started doing yoga again the other day, for the first time in ages, and was appauled at how inflexible I had become. This has nothing to do with new-year resolutions or any bullcrap like that, but I have really decided to start getting back into shape. I have gone this long without jogging before, but I was always able to pick-up where I left off with just a little effort. This time, I feel like I am back to zero. The force with which that cold hit me a few days ago has also opened my eyes to my true age. Dang. How come no one ever told me that old-manishness sets in at 33? My wonderful week of freedom is almost over. 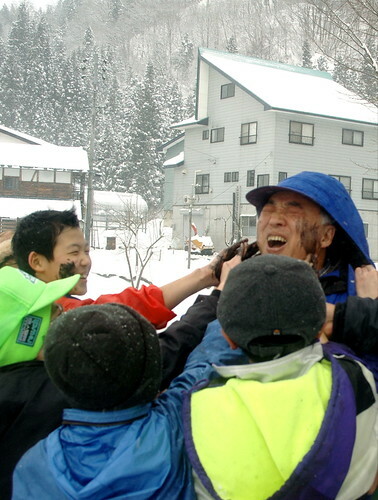 Tomoe's Outward Bound course will finish tomorrow, and I am supposed to be at the train station in Hiraiwa to pick her up. 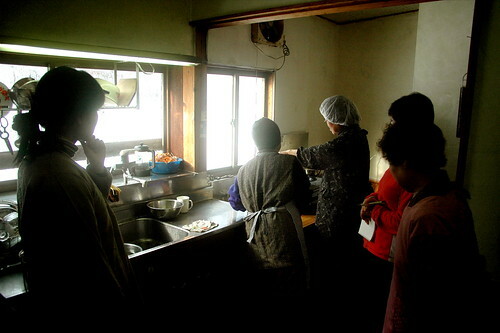 From there, we will head down to her parents' home to help them do some work on the house. 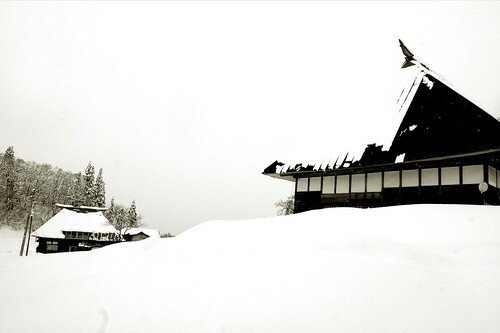 On the way, we hope to get chance to stop in Shirakawago, a world herritage site where the amazing traditional houses still exist. These are massive thatch-roofed houses, built so large, I am told, because land in the mountain vally is scarce, and in order to produce enough food for the village, they had to cram as many people into the one house as possible. I guess this is a traditional Japanese high-rise, except that in these houses, the inhabitants were all family, and there were no auto-locking doors. Having missed a few days of my one week of precious freedom due to a bad cold that made me want to stay in bed, rather than do work, I am rushing around these passed three days to do the One Life work I want to get done, as well as a lot of work on the house (mostly finishing the painting of the living room and kitchen) that is hard to do when Tomoe is either sitting in the living room, or working in the kithcen. The photo below is from my "power walk" to Okubo. 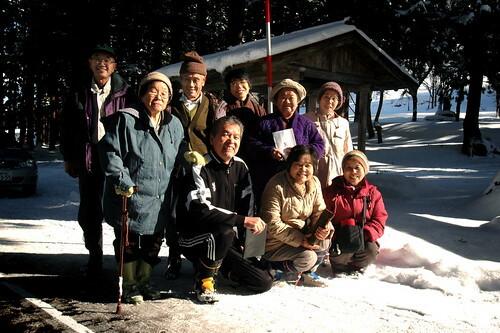 The photo above is of the folks in my Haiku club on our monthly outing. And, before I forget, or lose the paper I wrote them on, two more haiku that I had written for the club. 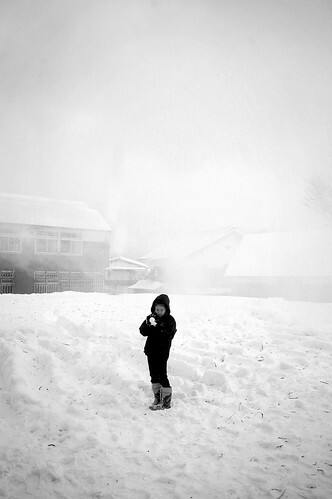 On January 15th, Tomoe and I set out before sunrise, fighting biting winds, blinding snow, and the little sprinklers that line the street to keep the snow from accumulating. After a long and arduous walk to the nearby hamlet, we finally saw a warm, inviting light in the window of a farm house. With any luck, this would be the family that invited us. Scrambling down a steep incline in thigh-deep snow, fearful of avalanches and hidden crevasses (drainage ditches), we arrived and with baited breath slid the front door open, desperately calling into the warmth, "Good morning!" Or hosts appeared with puzzled looks on their faces, wondering why we had bothered to come. The event we had been invited to, designated by the Japanese government as "an intangible cultural treasure", had ended ten minutes earlier - just about the time we were battling the fierce single digit temperatures as we tried, with slightly numb fingers, to put on our boots before leaving our own house. We were supposed to see a parade of children walking through the streets stopping at select homes to beat the bad luck out of people with big sticks, ending at the house we were visiting. Due to a small number of children remaining in the hamlet, the event took much less time than it would have five, twenty, or hundreds of years ago. Seeing the dejected look on our faces, the wife of the house disappeared into the back room, only to emerge within twenty-three seconds, with a consolation gift of grey potato jelly (konnyaku). The return trip was not so traumatic. In the meantime, the plows had been through to clear away the above-ankle drifts in the road and, although the sun was not yet up, the morning had begun to brighten. I went back to sleep, worn out from the night before when, due to a sudden onset of a cold, I went to bed around 11:00. Still, I had gotten little sleep as I worried about Tomoe, who would be catching a 7:30am train the next morning to Otari. As I lay there in my cozy futon, she was slaving in the kitchen to make enough soup to last me until she would return, a week later. 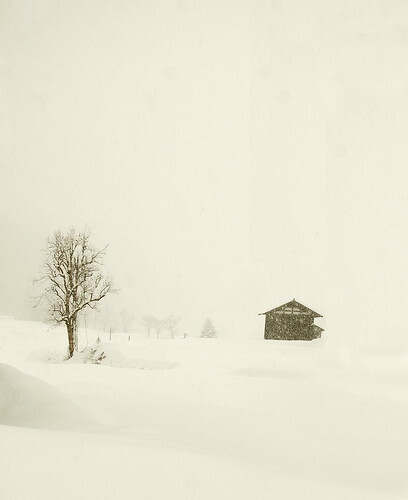 Somehow I managed to drift asleep for just a moment, awaking at 7:00, in time to prop myself onto one elbow and mumble something about "don't get in an avalanche" before hearing the sliding door close - the signal that it was OK to go back to sleep. My alarm rang two hours later, reminding me that I was expected at the local koshogatsu (little new year) festival at the local shrine. I threw on my boots, a jacket, and some gloves, grabbed a camera, and made the trek through snow that was now wonderfully, considerably deeper than just a few hours earlier. 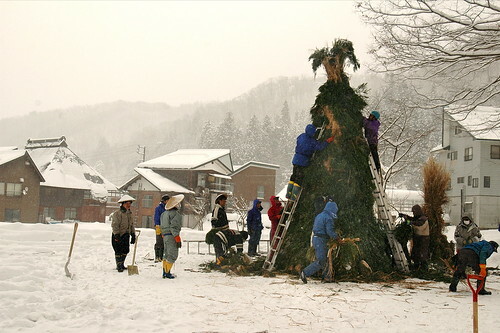 The koshogatsu festival is celebrated across Japan with various traditions, usually including the burning of a dondo yaki - a tepee like structure made of wara (rice straw), kaya (susuki, or some other thatching material) and, in our area, sugi (Japanese cedar) boughs. In some regions, they actually make room insidefor their small children. Here, though, the dondo was full of kaya. 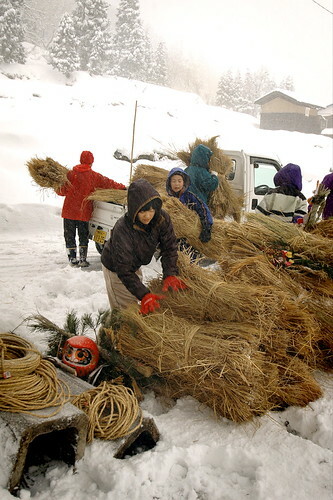 The wara on the outside is traditionally gathered by the children of the hamlet, who go door to door that morning to collect the three bales that every household is to leave on the doorstep. 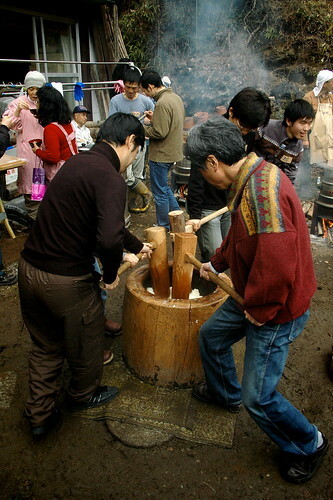 We only have enough wara to make our own natto (fermented soy beans made from a type of bacteria found in the rice straw), and most of our wara is from an organic farm, so there was no way we were going to give it up just to be burned, when the chances of finding chemical free rice-straw in this area are VERY slim. I suppose that in the past, children used a sled to transport the wara. Now, dad drives them through the streets in his pickup truck. 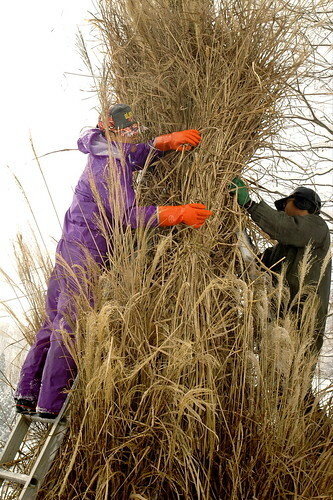 The photo above shows the unloading process. 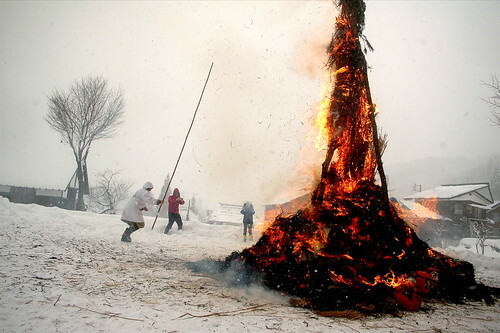 In our area, the dondo is made by the men of the hamlet the morning of the festival, however, some hamlets* build theirs a month or more ahead of time. 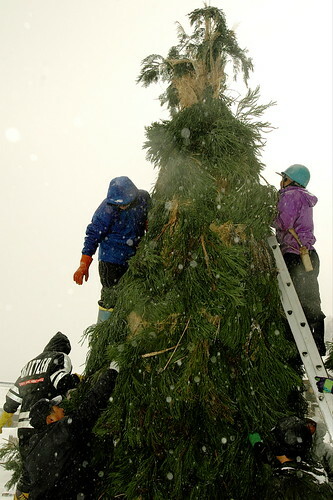 It is built with three big wood poles tied together at the top. 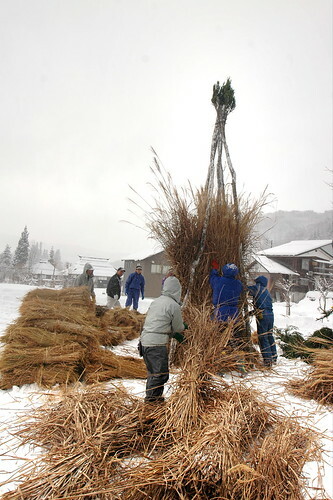 The kaya was placed in the middle, with bales of wara surrounding it, held together by a lot of straw rope. 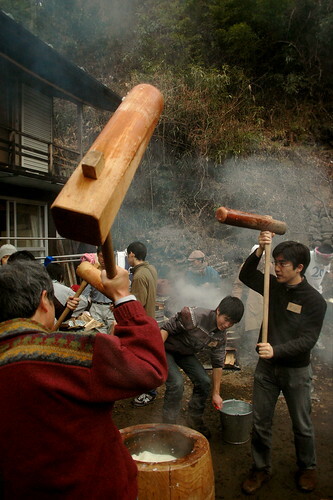 According to my neighbors, this year's dondo was bigger than they are used to - maybe 4-5 meters? During the building, only one old man fell from the ladder. Luckily, old men here are surprisingly agile, and he looked like an 80 year-old spiderman, springing back up the ladder before I even had a chance to say "uh-oh." Once the dondo is built, we are allowed to go home and go back to sleep until 1pm. 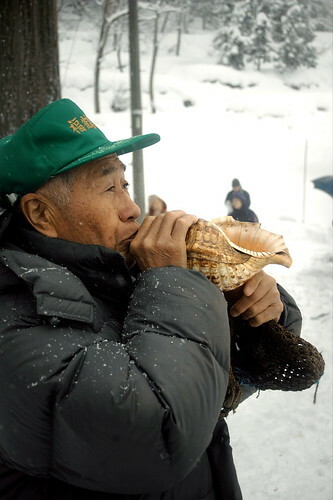 I was awakened by the sound of a conch shell being blown, and the smell of smoke drifting through my drafty house. 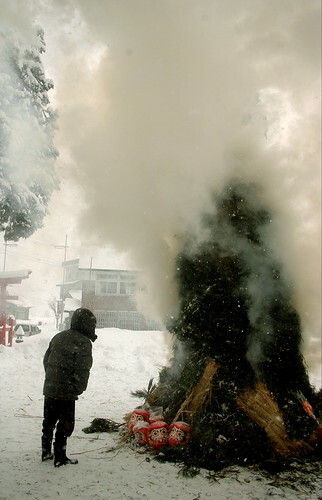 The smoke was from the gomakashi, a miniature version of the dondo that is burned first to make people think "Oh crap! I am missing it!" 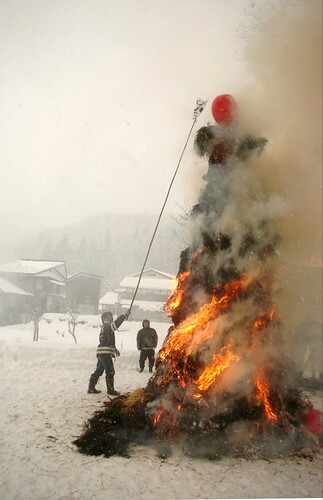 the people then rush to the shrine just in time to see the *real* dondo start to burn. Also included in the dondo are lots of daruma. Big red weeble-wobble heads that traditionally bring good luck. The concept behind the daruma is that you make a wish, or intention, such as "get good grades in school" for the new year, then color in one of the daruma's spooky blank eyes. 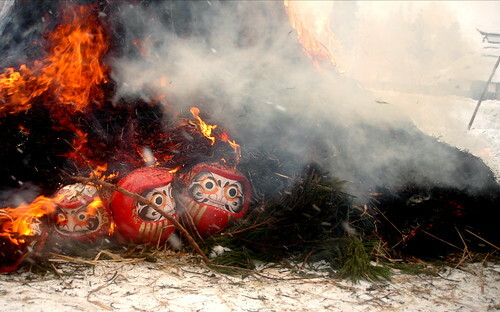 When the new-year intention is realized, you reward the poor daruma by coloring in the other eye and, at the beginning of the next new year, burning him with the dondo. I much prefer the daruma to the rabbit foot because with the former, you are making a conscious decision of what you want to have "good luck" for, and there is a constant reminder sitting there on your shelf, staring at you pathetically with one eye for an entire year. The simple role it plays in keeping one focused on the goal seems to me to be much more beneficial than just carrying around a lucky charm with no specific purpose. I just wish they wouldn't burn them in the dondo, as most of them are now made of plastic and toxins - not something we really want to be breathing as we pray for good health in the new year. 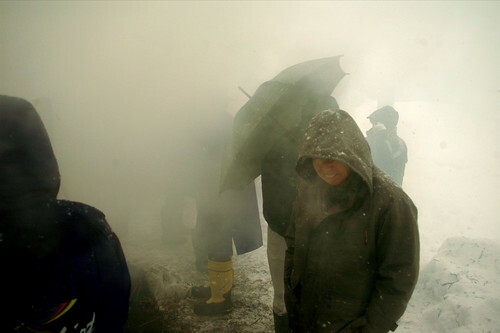 The dondo burns and people try to protect themselves from the smoke with umbrellas. 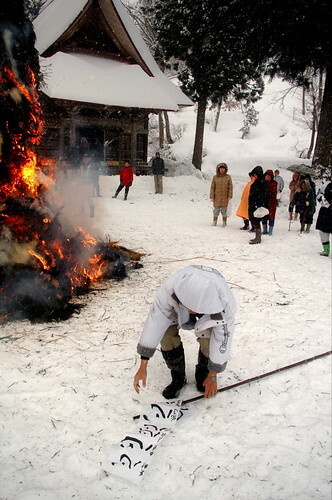 Once the fire's good and hot, people send their new year hopes to heaven by writing them, in their first calligraphy of the year, on big sheets of plastic. The plastic sheets are attached to the end of a long pole and held near the top of the really frickin' hot dondo. If the plastic with your first-calligraphy-of-the-year is lifted straight up by the heat, your hopes and dreams will be realized. If you are deterred by the heat and hesitate when you smell of your own burning eyebrows, your hopes and dreams will only fly sideways, pathetically drifting to the ground where they are destined to be trampled. 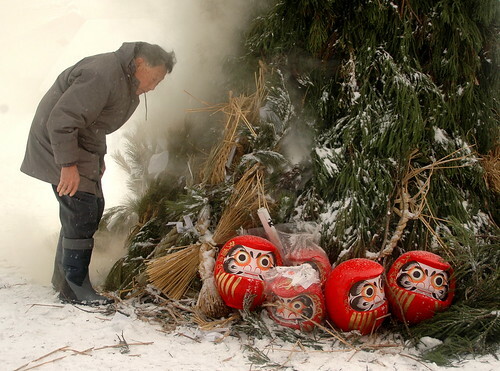 Unfortunately, its not enough for some people getting the bad-luck beat out of them in the middle of the night by children with big sticks, burning the daruma than helped them have good luck in the previous year, or melting their new gore-tex rain-gear as they send your prayers to heaven. 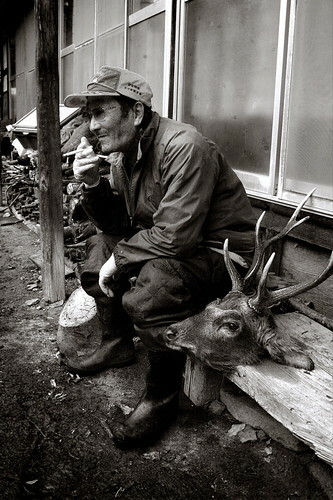 Some people need more help - namely, those for whom 2008 is a yakudoshi (a bad year), or those who have had something new happen to them, such as getting married in the past year, or starting grade school, or being born. 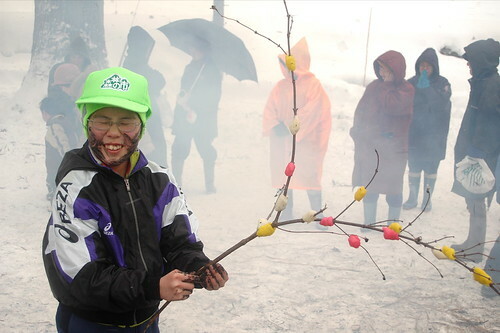 If you happen to be one of these people, you will need to have some of the ashes from the dondo mixed with snow until it is nice and pasty and can be used to paint your face. Once again, in a very Steven Kingly twist, it is the children that must stalk all the village members who are in need of this extra protection. Once they anoint one another, they begin chasing the adults around. In my neighbor's case, his newborn daughter could not be at the festival because tradition dictates that the child spends the first month of life at the mother's family home (my neighbors are the father's family). 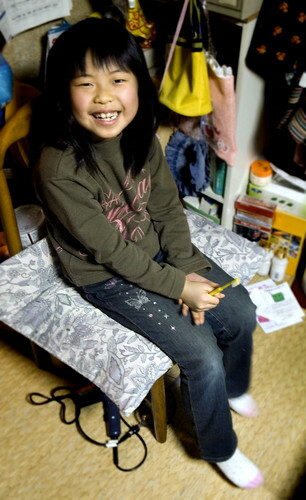 In place of smearing ash on Miyu's (the daughter) face, the father brought along a photo to serve as a proxy. The Children painted that instead. 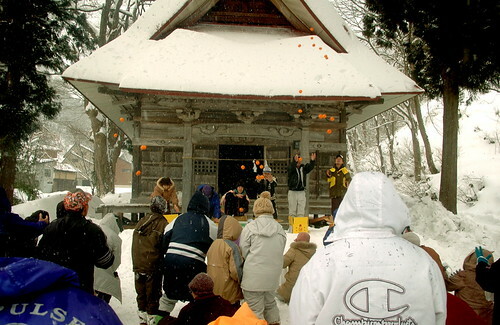 Finally, those who had their face painted, also gave a gift of mikan oranges to the gods of the shrine. Unfortunately, the gods don't have mouths, so they can't eat the mikan themselves, and while it is acceptable that someone else eat the mikan, it is not acceptable that someone else might use the box they were brought in for every-day purposes and, since it is a very sturdy and tempting box, it must be burned to prevent any temptation. The only way to get rid of the mikan so that the box can be burned in the dondo is to have a mikan maki party! The givers of these gifts line up on the shrine steps, and begin throwing the oranges out into the crowd, causing mayhem and madness. Luckily, no old ladies were injured in everyone's mad scramble to get as many oranges as possible. Partly because I was taking pictures, but mostly because it was my first time, my mikan catch was pathetic. I wrote a haiku about it for the haiku club meeting yesterday. With unrefined skills, I could not even pick up five oranges at the orange throw. I gave the oranges that I did end up collecting to our neighbors who, according to custom, are not to visit any celebratory events this year. 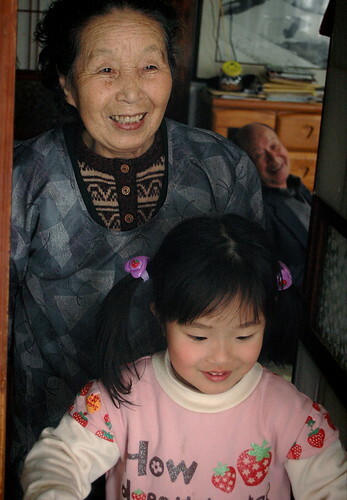 The husband's mother died in 2007, and as such, they are in a state of mourning. 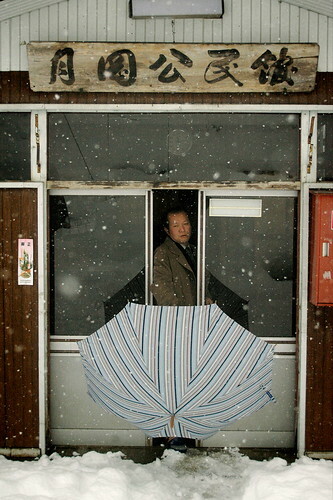 One would think that it would not be such a stress to skip the festival one year, but it felt so sad to hear his wife recount everything that happened at the dondo yaki, right down to how bad I was at picking up mikan. Apparently, she had been watching from the window. (our houses are right across the river from the shrine). Although, maybe she was not watching out of longing to be there, but just because she was worried... 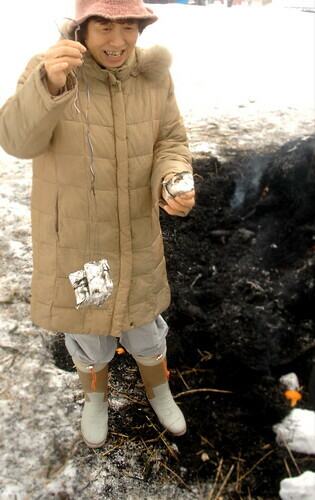 The day before she had given us some mochi (sticky rice) for us to cook in her stead in the ashes of the dondo, as is a tradition at the festival. When she asked us, she did not know that Tomoe would not be attending. When she found out that I would be in charge, I saw her split-second of horror. I half-suspect that the reason she paid so much attention to the happenings is that she wanted to make sure I didn't just pop the mochi in the kitchen toaster before bringing them over. 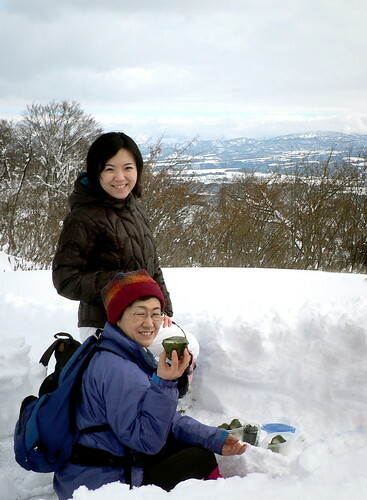 Tomoe is gone for a week snow-shoeing and camping in the snow-covered mountains of Otari Mura. I had hoped to take the opportunity to "get lots of stuff done", but the koshogatsu (little new year) festival happened the day she left, the next day I was just recovering - I didn't even drink! I just had a REALLY painful cold for two days prior, and then that day (when I had to get up at 4:30 am to participate in the festivities) and the cold just seemed to keep getting worse. I remember when I used to get a cold and think "What's the big deal... why are all these losers skipping work just because of a cold?". Black on white, a crow bathing in the snow bath? I wonder if the bright green cocoon stands out in the snowy mountain. On a winter day, the heated toilet seat is like heaven. Gold . . . gold . . . gold. Worthless, priceless dreamer's gold . . .
Gold of the sunset . . . gold of the dawn . . .
Gold of the shower trees on my lawn . . .
Gold that can not be bought or sold . . .
We slept in until 11:00 this morning. It strikes me that we are extremely spoiled. Not that we were able to sleep-in today, but rather that waking up at 6am the past three days was so hard. When I used to work a "real job" I would wake up every day around 6:30. Somehow, somewhere along the way, I got used to being able to decide my own wake-up time. 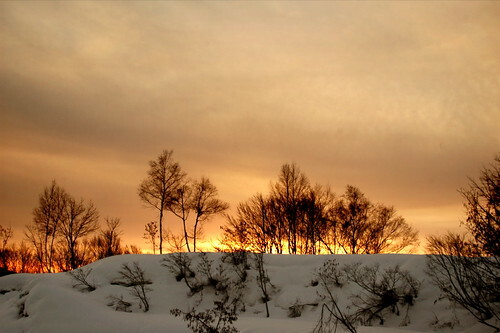 Now, when a customer says that she wants to go see the sunrise (or in this case early morning fresh-snow), I struggle. So yes, the customers are gone. I feel bad calling them customers, though, as they have become friends. 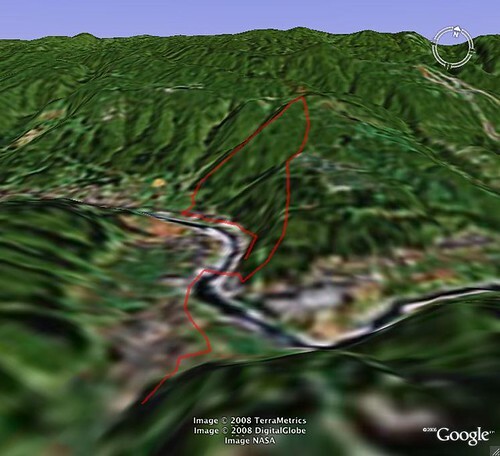 The way we run our tours is similar to what we would do for visiting relatives. 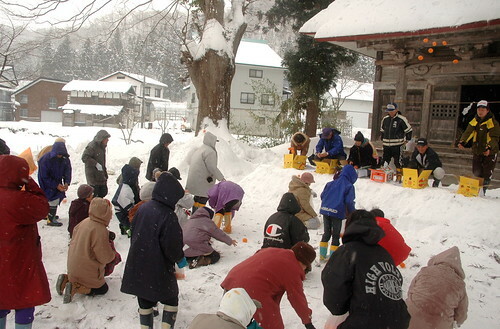 We eat together, go to the bath together, hike and walk around the village together, visit the neighbors together, and shovel our walk-way together. The biggest difference between having customers as opposed to friends or family, is that we clean the house for customers. The photographer / writer for Kura magazine came yesterday. He listened to our life-story (looking a little disappointed) and tried as hard as he could to ind things to take photos of in our not-so-old, yet very dirty house. He got a few shots from the little get-together we had with our neighbors and customers. 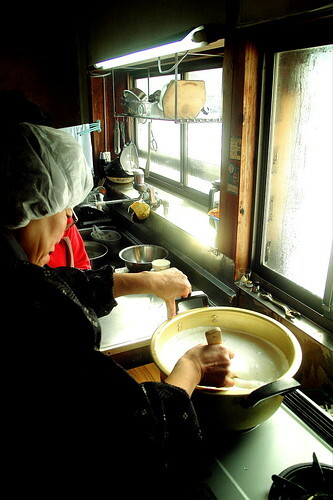 One neighbor taught everyone how to make tofu, and then we made some haya soba ("fast buckwheat". Its "fast" because you just cook the dough as a blob rather than rolling it out and cutting into noodles). 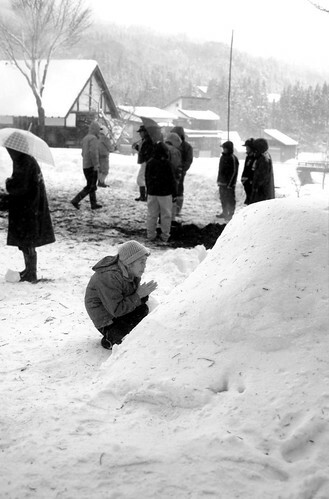 He took a few shots of Tomoe, me, and our guest shoveling snow, then a few shots of us digging out our pathetic daikon radishes from under the snow. I can't wait to see what the article looks like and how he uses his magic editorial powers to make us look interesting. I'm just taking a quick break (while we give our customers some "down time") to post a few more photos from the past few days. The snow started falling just in time for the new year, and by January 1st, we awoke to the scene below. I excitedly suggested that we allow the snow to build up on the Pug (our van) until we had to use it - this would be the easiest gauge of how much snow had fallen. 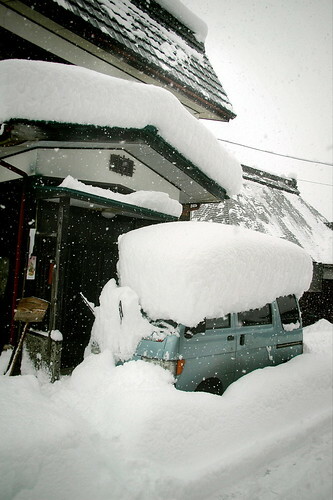 I was assured by neighbors (and by seeing other cars with much more snow) that it would not collapse the roof, but what I did not anticipate was that, as the snow grew increasingly heavy and drooped to one side, it could fall and brake the passenger-side mirror off. Du-oh! 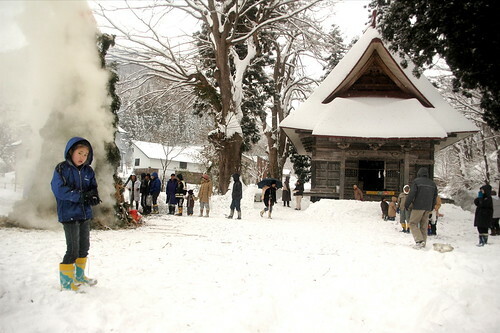 New Years day started with a yearly party at the kouminkan (citizen's hall - there is one in every village). The men started at 10:00, and the women at 1:00. I thought the reason was that the men need more time to drink and the women would join us in the afternoon, but it was just the opposite - if there is no deadline to get out so the women can come, the men will sit there and drink all day. Luckily, I was invited to a neighbors house to continue with some of the other men, once the women had taken control of the hall. I and another villager decided to crash the women's party, but soon we had to leave as they were preparing to do a dance that, I was told by my partner in crime, "men can not see". Later, Tomoe came home and told me of the strange dance that ended the party. The women formed a circle and sang a song about how dear and precious their husbands are. The dance includes grabbing their breasts and crotch. The way she tells it, it sounds like something you would see in a horror movie when an unsuspecting couple moves into a neighborhood where everyone is a cult-member or somehow possessed. Januray 2nd was spent cleaning the house for our guests who would come on the 3rd. Two hours of sleep and LOTS of coffee make for slightly nauseating day. 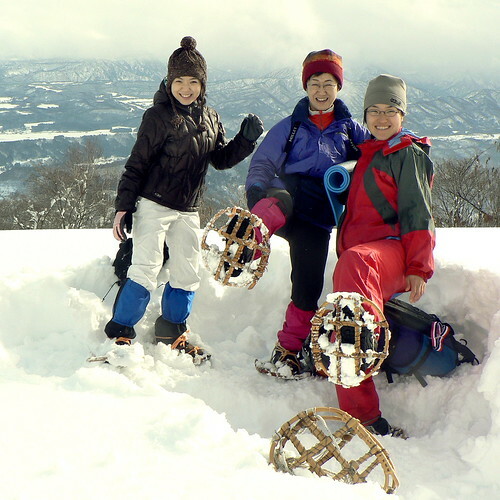 Even the two hours I lay in bed I could barely sleep as I was worried about the predicted bad weather, and how we would spend the day if we could not head into the mountains for kanjiki snowshoe walking. It was cloudy until about 9am when it miraculously cleared up and we were able to take the ski-lift up for another amazing view. 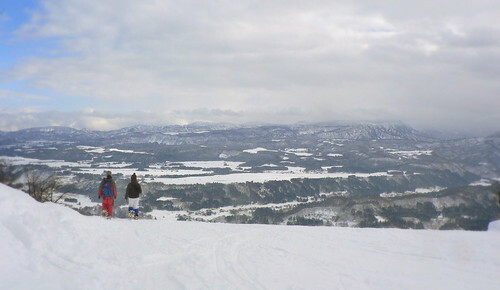 The big difference between this time and the time Tomoe and I went to check the course, was a meter of fresh snow. 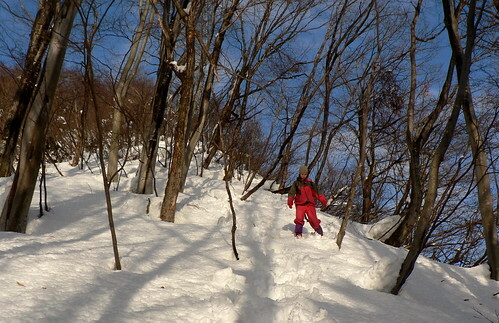 Even walking from the station to the lift took more than twice as long in above-knee-deep snow. Once we got to the top of the lift, we (I) was so tired that we only made it about 400 meters into the mountains before deciding it was the "perfect" place for lunch (and to call it a day). The usual way to walk with kanjiki as a group is to take turns in the lead. 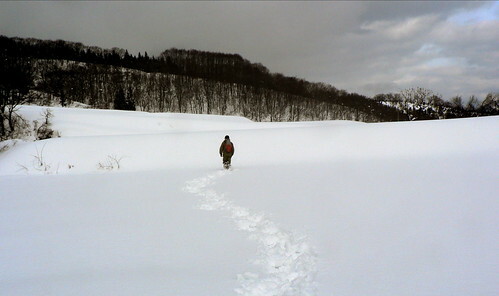 The difference in energy needed to plow through waist-deep snow, and the energy needed to be the fourth or fifth person to walk through a pre-made trail is enormous. In some cases it would not be strange to take as few as ten or fifteen steps before stepping aside and joining the group at the end of the line. 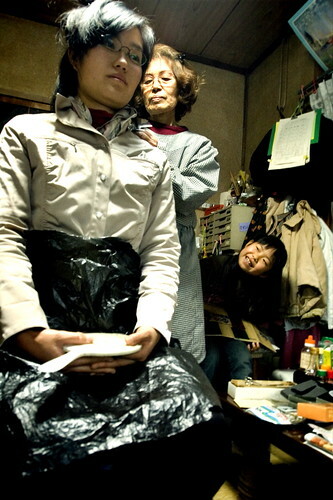 This time, however, I was with two customers, and Tomoe - all women. Not to be sexists, but after having them taking the lead for admirable distances, in the end, I was the designated "plow boy". 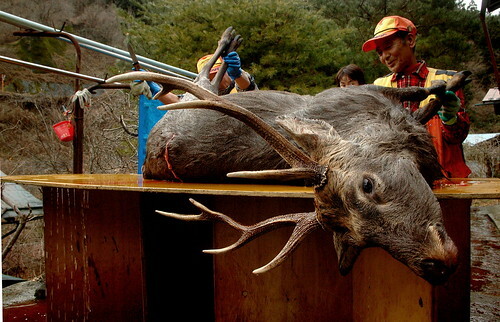 I have no idea how the traditional roaming matagi hunters of old every did it on their own. Today we went to Akiyamago again. This time it was a real adventure - at least for me (the driver). 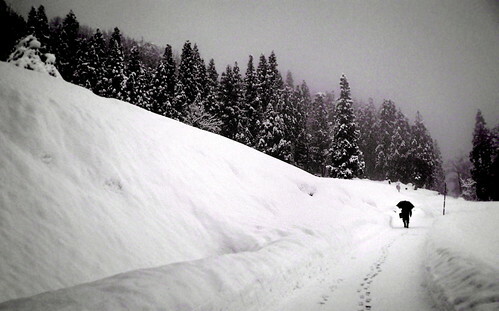 The snow fell all day and the road was a challenge. While I have driven roads much more slippery, they never had a 100 meter cliff (and no guard rail). We made it there and back in one piece, in time for a bath and great dinner (I wonder why Tomoe doesn't spend so much time when it is just me eating). Tomorrow is a big day. 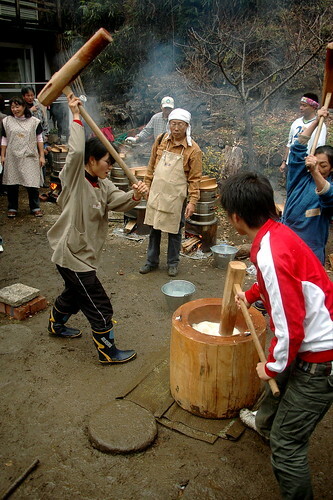 Some of the neighbors are coming over in the morning to make tofu and natto. 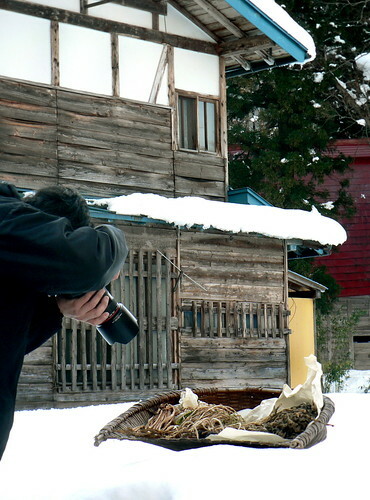 A reporter from Kura magazine is also coming to take some photos for the next edition. We should probably clean, but we figure that with this house there is little we can do, it's really all up to the photographer to work some magic. Judging from some of his previous work, I trust him to make us look better than we really are. We wish a happy new-year to all. This is certainly shaping up to be a great new year for us with almost a meter of snow in the past two days. Tomoe and I spent the weekend in Gunma Prefecture's Ueno Mura. 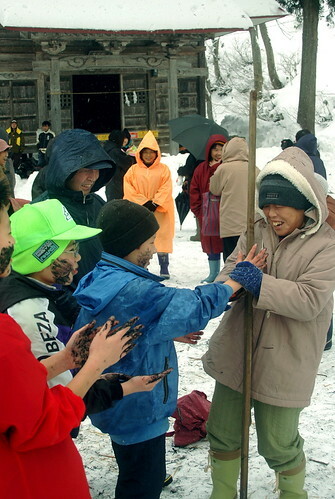 We were helping pound rice for elderly villagers so they could have a traditional new year's celebration - I just hope we are not responsible for any deaths. The highlight of the weekend though was when the neighbor and his buddies came back with a freshly killed deer. 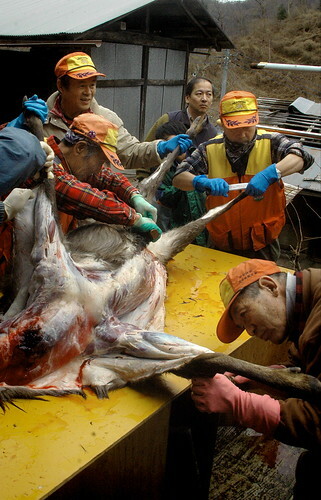 Coming from Michigan, one would expect that I have at least had plenty of opportunity to see deer beingfilleted, but I was one of the few people I knew that had never hunted. 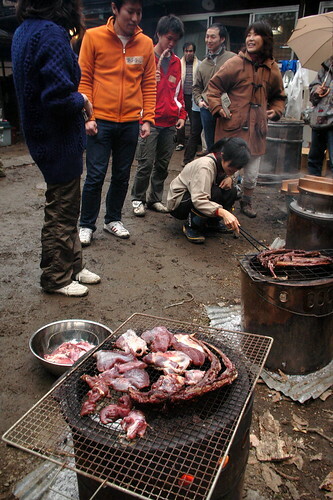 The deer meat was amazing. I almost had a chance to eat the raw liver, but there was too much going on and somehow we only ended up with a pile of ribs to be grilled. 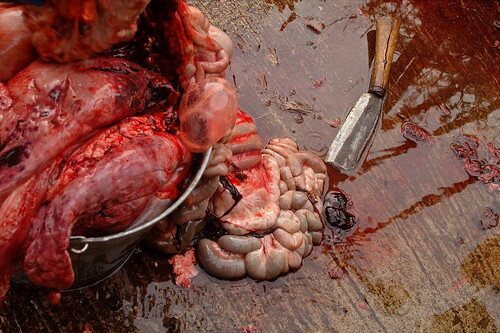 It reminds me of the first time I ever ate deer meat. I was at a friends house and his mother made it for dinner, telling us it was steak, thinking that if we knew it was deer we would not want to try it. It was the best steak I had ever had and it was not until I told her to give the recipe to my mom that she told me it was actually bambi.